Green Void was to provide a 3D example of futuristic design and engineering in dramatic contrast with this historic location. Yes, other similar forms exist as the Green Void; some of Anish Kapoor’s work & Zaha Hadid’s “Elastika” to name a few “popular” designs. With Green Void, the particular dynamics of curvilinear surfaces in fabric shells are presented in such detail to encourage further development with tension fabric. 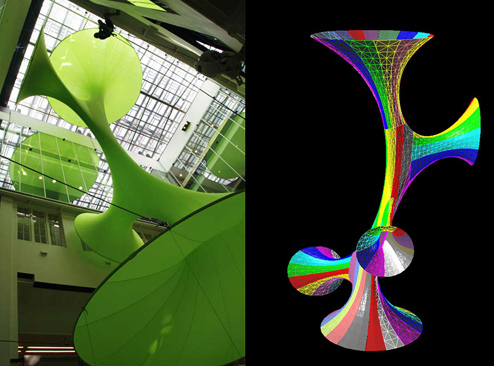 I’m not here to comment but to express passion in developing methods to create even more complex 3D parametric curvilinear surfaces … and yes, one day with dye sublimation printed graphics.